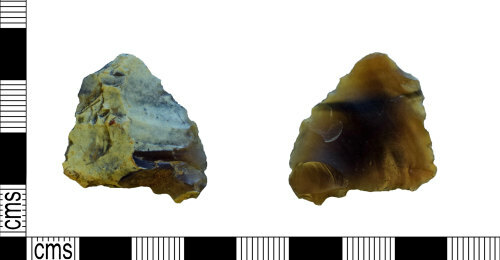 A complete flint blade of Neolithic date (3500-2300 BC). The lithic is triangular in plan and plano-convex in section. The All edges have regular low angle retouch similar to denticulation. The dorsal surface has covering scaled flaking with recortification over the proximal half. The ventral surface has ripples of percussion emanating from the proximal end. The flint is a dark brown in colour with dark grey inclusions. The recortification is dark cream in colour. Length: 28.92mm, Width: 28.06mm, Thickness: 7.22mm, Weight: 4.9g.